The Beatty Veterans of Foreign Wars post held its annual flag retirement ceremony at Beatty’s Desert Hills Cemetery on Flag Day, Wednesday, June 14. 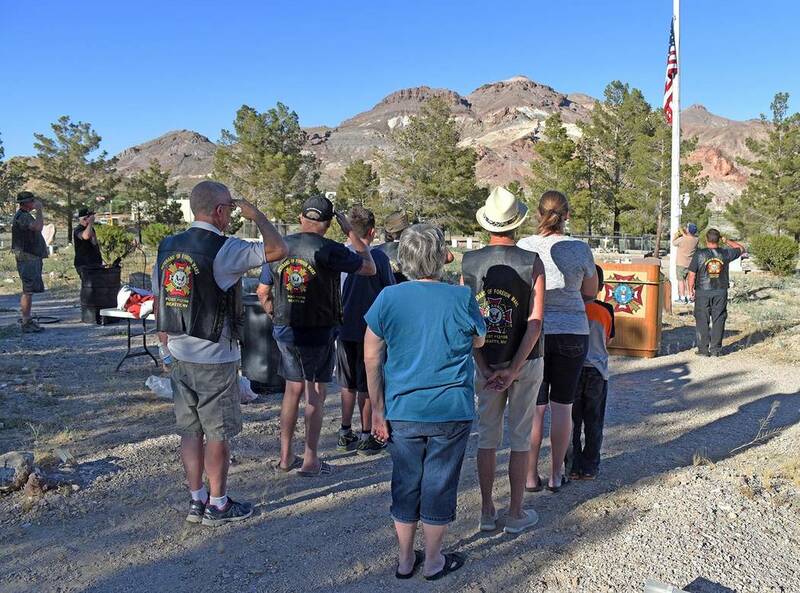 Richard Stephens/Special to the Pahrump Valley Times Crowd members salute while the national anthem is played and a flag that had been lowered to half-staff is raised back to the top of the pole June 14 on Flag Day. 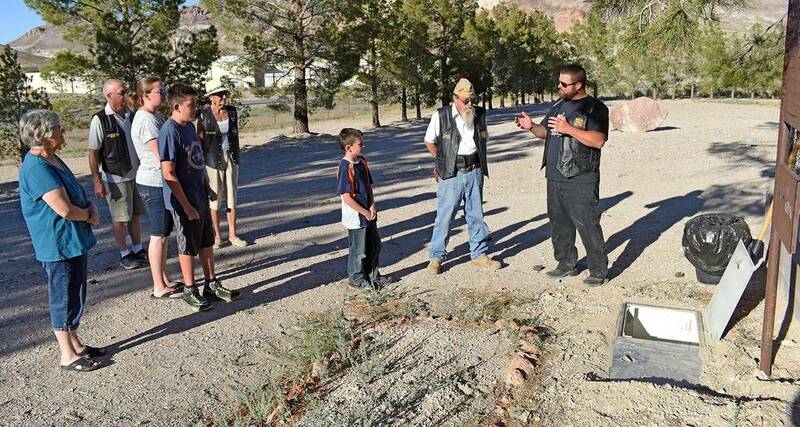 Richard Stephens/Special to the Pahrump Valley Times Attendees gathered for the burying of the previous year's flag ashes at a Flag Day ceremony in Beatty on June 14. The formal ceremony follows a formal format in which the flags to be retired are designated as having been examined and certified as no longer serviceable. Attendees also recite the Pledge of Allegiance and stand at attention for the playing of the national anthem. The unserviceable flags, which the post collects during the year, are then burned. Commander Rusty Anderson invited visitors to observe the burying of the ashes of the previous year’s flags. He explained that the flags can smolder for quite some time, so to be able to perform this part of the ceremony, they wait until the next year. This year Anderson and his wife Jennifer went to the Beatty Community Library the day before Flag Day to give a presentation to local children on the history of the flag and proper flag etiquette. He said that the children enjoyed learning to properly fold a flag. Each child was given a flag that was not in serviceable condition but not ripped or torn. They were given the choice of either cleaning the flag and keeping it or taking it to the retirement ceremony. At one point in the presentation to the children, the Andersons took them to a grassy field by the school and positioned them at the corners of an area representing the largest U.S. flag, the “Superflag,” made by Thomas Demski, which measures 505 feet by 255 feet. Flag Day, which was historically celebrated by a variety of communities and states, was first officially made a U.S. holiday through a declaration by President Woodrow Wilson in 1916 and was established by an act of Congress in 1949. The date commemorates the adoption of the first flag by the Continental Congress on June 14, 1777.